Christmas season would not be complete for us as a family without family nights and celebrating Advent together. For us, engaging in a family Advent experience leading up to Christmas is always a great way to keep Christ in Christmas. Advent has been a part of many Christians’ celebrations of the Christmas season for generations. Actually, Advent is a celebration of “the three comings” of Christ: (1) of his coming to the world on Christmas as a little baby, (2) of his coming into our hearts by faith as we put our trust in him; and (3) of the day Jesus will come again to bring us to himself, a day we look and hope for. Starting three or four weeks before Christmas, we reserve one night a week we to connect with our kids over a meal and an engaging time of remembering the real reason for the season. This advent guide is Part Two of 5 Family Advent Experiences. These can be used once a week, once a day for 5 days or in any sequence that you can fit into your family schedule. 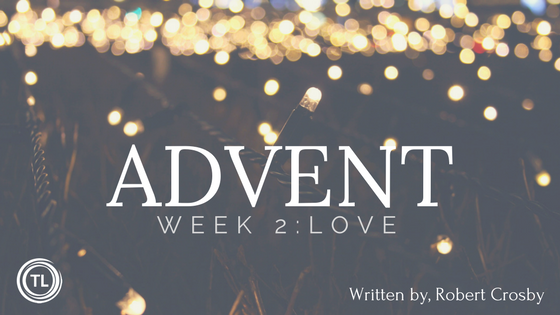 Below you will find all the information you need to prepare for Week Two of the Family Advent Experience. The structure is short and simple, but we also have provided some extra ideas so you can tailor it to your family and setting. You can use this week to connect with your family tribe and learn about one of the most dramatic moments in the Christmas story – the story of Mary and Joseph. Setting Up: Before you gather your family for the Second Advent Experience, take a little time to prepare. Make sure your advent wreath is ready, also that the candles and a lighter or matches are ready. Some instrumental Christmas music in the background always helps. You may want to dim the house lights just a bit to set the mood and focus of the night, and so the candles will shine bright. If you are going to have a meal together before or after the Advent experience, get ready for this to not take too much time so you can focus on advent. Lighting the Second Candle on the Advent Wreath: You may want to turn all, or most, of the lights in the room out. Then, someone in the family should light the First and Second Advent Candle. This would be two of the 4 white exterior candles around the Advent Wreath (not the center candle yet – that is not lit until Christmas day). Reading the Bible Story: Read Luke 1:26-38; Matt. 1:18-25 –– the story of Mary & Joseph waiting for the Christ child to come. You may want to use BibleGateway.com or Youversion.com to find the Biblical passage. If your children are old enough (pre-teen or teen years) you may want to read the passage, have one of them read it or listen to an audio version on YouVersion.com. If they are younger, we suggest you “tell” the story, dramatize (or activate) it, using the next, Making It Plain, section. Acting Out the Bible Story – Making it PLAIN: Create your own drama production of the Mary & Joseph story, your own nativity drama right there in your family room. Assign a role in the story to each of your kids. For example, one of them can be the reader, one can be “Mary,” or “Joseph”, another can be “Gabriel”, the angel, etc. Also, you may want to have your spouse or one of the older children video this for legacy sake and for future use. (To this day, our kids love to look back at some of the earliest Bible story times we had together when they were little). As you re-tell this Biblical story and focus on the LOVE that Mary and Joseph had for God and how they had to trust him in so many ways. Take your time as you read the story. No rush. Read short parts and then have the kids act it out, phrase by phrase – even more than once. They can even take turns playing the various parts. “Good morning! You’re beautiful with God’s beauty, Beautiful inside and out! Mary as thoroughly shaken, wondering what was behind a greeting like that. But the angel promised her, “Mary, you have nothing to fear. God has a surprise for you: You will become pregnant and give birth to a son and call his name Jesus. (Note: You may also want to read and act out the story of Gabriel telling Joseph the same news, only in a dream – Matt. 1:18-25). Food to Share – One way to make this night memorable and multi-sensory for your family is to add some kind of food to the night. Let the kids make their favorite cookies. Bring them into the process of WAITING for the dough to be ready, WAITING for the cookies to bake, WAITING for them to cool. Then – while they are eating and enjoying the finished product, talk about how good the cookies are and how they were WORTH THE WAIT. Songs to Play or Sing – Some of the songs that relate to this week’s Advent theme of Mary and Joseph include Mary’s Boy Child, Mary; Did You Know? ; & Ave Maria. An Activity for Younger Children – At the start or end of your Family Advent Experience, play a game of “searching for Mary & Joseph”. Before the night starts and while the kids are out of the room, hide the two little statuettes from your nativity scene somewhere in the house. At the right time let them search for them with you notifying them of their “hot” or “cold” proximities. This is a great way to liven the night up and burn off some excess energy. An Activity for Pre-Teens & Teens – Ask Up! – Take time to ask them Questions that relate to the theme of LOVE and WAITING. Let the discussions flow as best they can, allowing your kids to open up as much as they will and for you to hear each other well: How do you feel about waiting in line? What is the longest time you have ever had to wait in line? Do you get impatient? What do you do to deal with it? What are some things you would be willing to wait for? What do you think it must have been like for Mary to wait for Jesus to be born after the angel gave her the news? What is someone or something you “love” so much you are willing to wait for them or for it? Thank you for the story of Mary and Joseph. It is amazing that you chose two ordinary people to bring the Son of God into the world. You could have sent Jesus on a throne or in a spaceship. Instead, you brought him into the world through a young couple, a family. They had to use a lot of faith to trust you and to wait for Jesus to be born. Thank you for their faith that was a part of welcoming Jesus into the world. Help us to open our lives more to Jesus, to his love and to all he wants to do in and through our lives to make that love known to people around us. We welcome Jesus to come here now, to live in our hearts and home and to live through our family. NOTE: Give us feedback on how it went or if you have any questions. Looking forward to sharing our Advent #3 Lesson on Joy next Monday. Read more blog posts like this one from Robert & Pamela Crosby – Teaming Life at teaminglife.com.